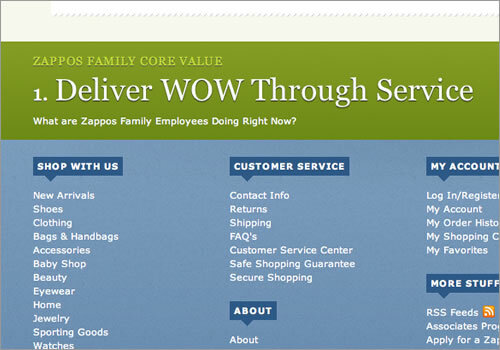 Consider the difference in customer perception between Zappos and Comcast. Customers routinely rave about one, while the other was attacked with a hammer. Clearly, there’s a difference in the way they deal with their users. One of the biggest differences between the two is that Zappos appears to go out of its way to deliver great customer service long before a user ever has to deal with a representative. The differences aren’t just in the way they treat unhappy customers. Zappos makes a concerted effort to prevent customers from ever being unhappy in the first place. And that’s a good policy, because unhappy customers are expensive. I spend a lot of time talking to customers, customer support reps and community managers. I’ve learned that there are three types of users who take up an inordinate amount of time and energy for customer service departments and cost far more money than they should. The great thing is that the behavior of many of these users can be improved or corrected with the right set of features and a proactive interaction design. Let’s look at some of the folks who are costing you money and time. I’ll call them idiots, drama queens and scammers. Customer service representatives spend a lot of time explaining obvious things to users. Recently, I spoke with a community manager for a web-based marketplace where users can sell things to other users. The community manager was annoyed because he routinely had to explain to the sellers, “If you ship something to an overseas army base, it will take longer than it does to ship within the country.” He couldn’t believe that people didn’t know this. He thought they were idiots. But are these sellers really idiots? Of course not! They might be geniuses who just don’t ship things on a regular basis, so they don’t know that an APO address indicates an army base that might be overseas. As far as the seller is concerned, they’re shipping to a regular domestic address and now have to wait almost a month to get paid. In fact, a huge proportion of the time, the “stupid questions” that customer service representatives get over and over aren’t stupid at all. They’re opportunities to improve the user experience design. If you’re getting the same question, it probably means you’ve made an incorrect assumption about information that a typical user is likely to have. In our example, the company was mistakenly assuming that everyone knows what an APO address is and that delivering a product to one could take up to a month. Spend some time with your customer service people, and find out what questions are being asked repeatedly. Figure out a way to answer those questions within the interface so that someone doesn’t get to the point of having to contact support. In our example, the company could add a small note to all APO addresses, pointing out to sellers before they ship that the address is for an army base and warning that delivery could be significantly delayed. It probably won’t stop every inquiry they get about this problem, but it should help just by letting people know what to expect. Too often, interactions with certain customers blow up far more quickly than service reps expect. As soon as their special requests are denied, some users will rant and rave and threaten legal action, while others calmly accept the fact that rules apply to everyone equally. If you talk to customer service reps or community managers, they could probably name a dozen drama queens off the top of their heads. And they won’t look happy doing it either. You’ll see eye rolling and head shaking. One client complained that every time they released a new feature or a significant change, their power users would blow up and start screaming and yelling about how the company was trying to ruin their lives. It got to the point that the product manager was terrified of releasing anything new for fear of angering customers. The saddest part of all of this is that the people who cared the most about the product were the ones who were complaining the loudest when things didn’t go their way. You might think that you couldn’t do much as a user experience designer to calm drama queens, but you’d be wrong. One of the main reasons why people escalate to that point is that they feel they’re being ignored. In fact, one of the most common reasons that customers leave is that they believe the company doesn’t care about them. Your job is to make them feel that their opinions are important and that they’re being heard. One way to do this is to provide a good venue for them to express their opinions. Unmoderated or lightly moderated forums where they will talk to other people who are also unhappy are not good venues. One-on-one conversations with staff are the best, but talking to every unhappy customer is obviously not always possible. A client of mine had a great way to deal with this problem. The company needed to recruit people for user research. Meanwhile, a number of people were writing in with complaints. So, the company frequently asked those people to participate in user research sessions. Two birds! You’d think that the users’ responses would be skewed because they were already unhappy, but this could be easily controlled in the sessions. The complainers were much easier to book as research participants because they had initiated the contact, and they always ended the sessions much happier for having been asked their opinions. Another important way to minimize drama is to involve important customers early on in design changes. Sure, power users often push back when you make a major design change, but that push is significantly softer when the change is an obvious improvement and people know what to expect and feel that their opinions have been taken into account. You can keep the community on your side by getting their feedback during the design process and keeping them in the loop on the progress of changes. Allowing them to opt into changes and to give early feedback can really improve your relationship. Even more importantly, involving your most important users early on will significantly improve the design of the feature, since you’ll be able to anticipate any complaints and edge cases. Scammers are both the hardest and the easiest group for customer service reps to deal with. They’re tough, because determining whether someone is a scammer or just an idiot or drama queen is not always easy. They’re easy, because once you know for sure that someone is a scammer, the correct thing to do is ban them immediately and never let them come back. The biggest problem is that misidentifying legitimate users as scammers can have an incredibly negative impact on your business. No one likes being accused of something they didn’t do. Also, in a social environment, the behavior of scammers can have a negative effect on other users. Think of fraudulent buyers and sellers on eBay or the highly publicized assaults by people who advertise on Craigslist. Sorry, you can’t! What you can do is quickly identify the bad actors and get them off your website as quickly as possible before they negatively affect your good customers. Enlisting the help of the community in policing can make this process much faster and more effective. Give users tools, such as flagging and comments, to report and protect themselves from scammers. Enlist community moderators to interact regularly with other members and alert you early on when someone seems to be doing something sketchy. Obviously, these three aren’t the only types of users that your customer service people will deal with. There will be the normal folks who have a genuine problem with your service or who find bugs. There will be people who want to cancel a subscription or ask a question about a policy. 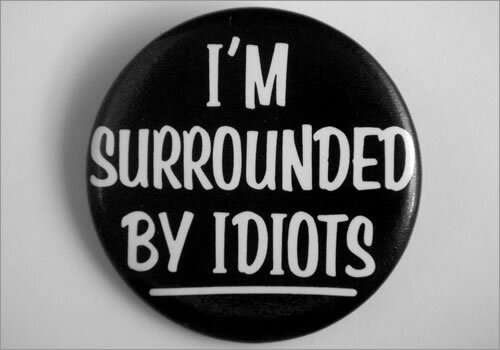 But idiots, drama queens and scammers are the ones who will take up a disproportionate amount of your time and energy. They are the ones who can sap the spirit from your customer service reps and make them less able to deal with other problems. Luckily, they also have the kinds of problems that you can address in your user interface. By providing the right information at the right time and enabling customers to report bad behavior, you can dramatically lower the amount of time you spend dealing with problem users. And that means you’ll have a lot more time to deliver fabulous service to your best customers!